About 7 species, widely distributed; besides the following another occurs in the southern United States and one in western North America. 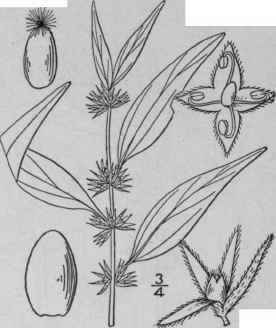 Type species: Parietaria officinalis L.
P. pennsylvanica Muhl. ; Willd. Sp. PI. 4: 955. 1806. Annual, pubescent, stem weak, simple or sparingly branched, ascending or reclining, very slender, 4'-15' long. Leaves lanceolate or oblong-lanceolate, membranous, dotted, acuminate at the apex, narrowed at the base, 3-nerved and with 1-3 pairs of weaker veins above, slender-petioled, I' - 3' long, 1/4'-1/2' wide; petioles 1/4"-1" long, almost filiform; flowers glomerate in all except the lowest axils, the clusters shorter than the petioles; bracts of the involucre linear, 2-3 times as long as the flowers; style almost none; achene about 1/2"long. On dry rocks and banks, Maine to Ontario, British Columbia, Nevada, Tennessee and Mexico. June-Aug. Hammerwort.